This site was developed for those interested in keeping diamond doves as pets. Additional information is also provided for the other four Geopelia doves, ringneck doves, mourning doves, and rock doves. The site also includes photographs of all the North American doves as well as many of the doves found throughout the world. Helen White has been diagnosed with Stage IV lung and liver cancer and may not live much longer. She is no longer able to answer any questions. The web site will continue to be available on line indefinitely, thanks to an anonymous hosting company. This web site is dedicated to those beautiful, small, delicate diamond doves and the people who enjoy raising them as pets. We have been raising these birds since 1984. That spring we found a small female in our back yard and four months later we purchased two males and another female. In time our flock grew to over thirty birds. We have enjoyed these doves immensely. Each has their own personality. Some are terribly aggressive, some are very relaxed, some are funny, some have become very affectionate, and others remain quite distant regardless of our efforts. In the beginning we developed this site as a fun project and also because when we first started in the winter of 1996/1997 we could not find any information about diamond doves on the internet. We make no claim about being experts of any kind. This site is simply a reflection of our experiences with our birds, information others have shared with us, and what we have read in the few books that are available. If you are thinking about raising these doves, or are just beginning with one or two as pets, perhaps this site will be of some help. If you do not find the information you want here, you should consult the references listed at the bottom of most pages in this site or try the links to other sites provided in the left side menu. If you have information you think we should include here, please send me an email and let me know. A number of correspondents have already provided additional information since 1997. Although this site was initially designed to provide support for those raising diamond doves, it has been expanded over the years to respond to reader's comments and questions. It now includes pages on the other Geopelia doves, ringneck doves, Eurasian collared doves, cape doves, mourning doves, rock doves, and photos of all the North American doves. Over the years we have had experience keeping all of these doves except three of the Geopelia doves and the cape dove. A final page includes photos of examples of many of the dove genera found throughout the world. In recent years it has become apparent that viewers have had difficulty in locating the subject matter they were interested in so we have made some changes in 2004 to make navigation easier. The main method of access is the left site menu visible on every page. 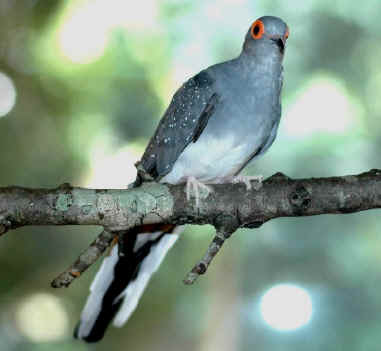 The menu contains links to each page on the site except for three of the ringneck dove pages ands the page for each species of the Geopelia Doves. If you go to the first ringneck page, the left side menu expands so you can access the other three ringneck pages. The Geopelia dove species menu includes links to a page for each of the five species. In 2005 a site map page that not only lists each page in the left side menu, but also include the main paragraph headings for each page. Hypertext links the page headings in the site map with the actual page. The contents of each page in the site map are not linked. To locate a subject in an actual page use the bookmarks at the top of each page to link to one of the main headings listed. (Unfortunately this page has not been kept up to date with recent revisions. We hope to remedy that this winter 2012-2013). 1. Diamond Doves - About the bird, natural distribution, native habitat, foods, etc. 2. Acquiring Diamond Doves - Things to consider when you are thinking about acquiring one or more diamond doves. 3. Caring for Diamonds - How to provide a good environment for the birds. 5. Raising Diamond Babies - What you may want to know about the incubation of eggs and the raising of babies. 6. Growth of a Diamond Baby - Daily photographs of a baby from egg hatching until the baby are ready to leave its parent's cage at 21 days. As far as we know, this site was the first internet site on diamond doves. The original site only included four pages which were all related to diamond doves. Then in 1999, when the site first appeared on national search engines, people from all over the world started writing to us. Because there were no other dove sites available at that time, many people wrote in asking questions about other dove species. First were numerous inquiries concerning ringneck doves. So a page was added about this species. During the spring nesting season for mourning doves in 1999, there was a great number of inquires by people who found mourning dove babies abandoned by parents, eggs from broken nests, birds that needed help with their nests, and an occasional injured bird. That spring, mourning dove inquires far exceeded those concerning diamonds, ringnecks, and other dove species. So a page was added for mourning doves. Then in January 2000, Dr. Charlotte Van Hoozier wrote for information related to the care of her two white tail diamond doves that she purchased during the previous September. Dr. Van Hoozier was an unusual caretaker because she carefully watched every move her birds made and thus in a short time came to know her birds better than many of us do in years. To assist her in understanding her birds she kept detailed records of their activities and took numerous photographs throughout the year 2000.Then she decided to write a book and share her observations with others.. Her book, titled "Diamond Doves: A Year in the Life of My Diamonds, Abe and Sarah." was released in May 2001. The book is now sold out and currently there are no plans for reprinting. In 2001, Dr. Van Hoozier provided me with copies of some of her photographs and documentation. I have used these photos and documentation in the addition of two new pages for this site. The 2001 revision also includes a list of references for each page in the site. In 2005 we added a new page called Living With Diamond Doves and reorganized the diamond dove data on all pages into what we hope is a more logical format. We have added information on the use of a hospital cage which has long been missing from this site. We have also changed the format of the Geopelia Species page and the Dove Genera of the World page. The Other Native Doves page was changed to Dove Species Found in North America and includes all doves native to Canada and the USA. And late in 2005 we added a page on rock pigeons since they are ever present in this city and also make excellent pets. In February 2006 our oldest diamond dove died at an age of 21 years and 1 month. This bird, a female named China, became very special during the last four years of her life. She took care of her mate who died in July 2005 and a friend and his mate which were a few years younger but even more frail than she was. I have created a new page, Tribute to China, which outlines how special she was. Also in February 2006 we obtained a pair of zebra doves and have started a new page for this species. It can be reached by going to the "Geopelia Species" page (left side menu) and then selecting zebra doves on the left side menu of that page. A number of readers have asked about directions on taming a dove. So I finally wrote up a paper on taming doves that are based on my own experience and not any research. I sent it to a few people and they said I should include the paper on the web site even though I had doubts. The link is Taming Doves. In the past years readers have commented about the lack of photographs on the mourning dove page. In 2006 we weren fortunate have two readers that have supplied us with photos of mourning dove pairs and their babies that nested in their planters and became tame enough to allow some close up shots. To see these photos click on the Mourning Dove page on the left side menu. People using the pages for the other Geopelia doves, ringneck doves, Eurasian collared doves, mourning doves, or rock doves can find additional information that they might find useful on the diamond dove pages. The following diamond dove pages have information that apply to taking care of any of the above doves: Acquiring Diamond Doves, Caring for Diamonds, Living With Diamonds, and Raising Diamonds. While some information on these pages only apply to diamonds, the reader should easily be able to discern what information applies to the doves he is concerned with. We first installed two bird feeders on our bedroom window several years ago. We wanted to attract doves but our feeders were too small. The doves were too big to perch on thin rail that circled the bottom of the feeder. We purchased a suction cup plastic feeder we obtained from Walmart and we used regular wild bird seed obtained from a supermarket. It took several months before some house finches found the feeder and soon after the cardinals came along. They always came to the feeder soon after sunrise and always provided a happy good morning song to wake us up. About a year later the squirrels found the feeder and we were advised to change to safflower seed. The squirrels went away and so did most of the cardinals. A few house finches remained. Then there were few visitors for some time. The following spring I observed a mourning dove standing on the window ledge stretching as far as he could to reach the seed in the feeder. So I repositioned the feeder so it was lower and I found the mourning doves could easily reach the seed. That spring we had many adult doves on the feeder as well as their fledglings. And ever since they have been the primary visitor. While only two doves can eat at a time, others will wait on the window ledge and peck at the backs of the others if they are two greedy. If there is a larger crowd others will wait on the roof of the adjoining apartment. In 2010 beside the mourning doves there have been house wrens, a few cardinals, chickadees, and some kind of finch. I took special notice of the finches as they took great glee in taking the seed out of the feeder and spreading a thick layer of the seed on the window ledge. Perhaps their idea was to give more birds the opportunity to eat the seed at one time, but the doves preferred the "fresh" seed directly out of the feeder. A recent note of interest is that parent mourning dove are bringing their fledglings to the window sill and apparently order them to eat and then stay there until the parent comes back for them. Sometimes other doves will take issue with this and try top chase the fledgling away but they are back as soon as the other doves leave. Photo credits are provided for those photos taken by others. Some credits are listed by the photograph concerned and where there is a long table of photos the credits are at the bottom of the page. If you wish to use any of these photographs you must contact the photographer for his or her permission. Photographs without credits were taken by myself. My photos can be used for personal use but if you wish to use them on the internet or to make a profit, my permission is required. This site has been developed primarily for those who wish to keep doves as pets in their homes rather than people interested in breeding for commercial purposes or for the development of new genetic variations. We have only had experience with diamonds, ringnecks, Eurasian collared hybrids, zebra doves, rock doves, and occasional mourning dove babies which have been raised and released. We have had no experience with keeping birds in outside aviaries. Although people do write for advice we can only respond with second hand information.